Biltmore will feature 45 stained glass lamps and other items from Louis Comfort Tiffany and the Tiffany Studios in a special exhibition at Biltmore’s Antler Hill Village, from July 1 through October 23, 2011. 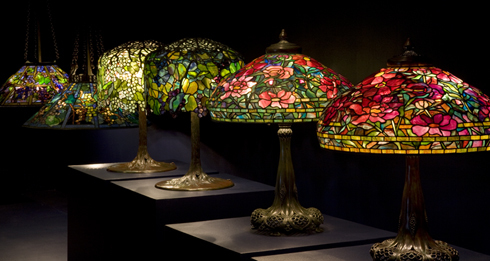 The Neustadt Collection of Tiffany Glass in New York traveling exhibition (photo above from their website) features designs inspired by the natural world and speak to Tiffany’s attempts to create something that was both artistic and useful. To complement the exhibition, Biltmore is placing Tiffany-inspired creations in Biltmore House and around the gardens, including dragonflies (40 feet tall!) made of flowers and foliage, a 24-foot “Living Wall” of flowers and plants that mimic stained glass near the Conservatory, and floral decorations in tribute to Tiffany’s love of botanicals. And don’t forget — when you stay at the Inn on Mill Creek, you can get two-day tickets for $49. No transaction fees or extra charges. Just the opportunity to stretch out out your time at Biltmore and take your getaway at your own pace. This entry was posted in Uncategorized and tagged art, Asheville, Biltmore by Inn on Mill Creek. Bookmark the permalink.